The UPS-1 and ONEcleaner Medical Ultrasonic Cleaner Solutions contain a proprietary blend of surgical instrument lubricants, surfactant detergents, and a four enzyme cleaning matrix: protease enzyme ultrasonic cleaner, amylase enzyme ultrasonic cleaner, lipase enzyme ultrasonic cleaner, and carbohydrase enzyme ultrasonic cleaners that work together to effectively clean and protect stainless steel surgical instruments and scopes. The UPS-1 and ONEcleaner Ultrasonic Surgical Instrument Cleaners will thoroughly and rapidly break down and clean all forms of proteinaceous bioburden, including blood, fat, carbohydrates, starches, and protein. 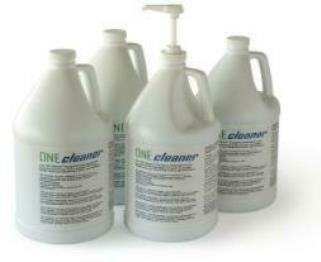 Ultrasonic Surgical Instrument Cleaner Solutions.